19 organizations are members of the Cincinnati Regional Coalition Against Hate, a nonpartisan alliance of organizations committed to being vigilant of and opposing hate activity by supporting impacted communities, responding in solidarity, and providing community education to foster acceptance, compassion and justice for all in the Cincinnati region. Cincinnati native Jeffrey Silverstein recalls the scent of tear gas and the palpable tension in Charlottesville last summer, where he traveled to support his sister, a local rabbi. While he and his family sang songs of peace to drown out the cacophony of hatred, the alt-right chanted the Nazi slogan “Blood and soil!” For the first time in his life, he thought to conceal his Jewish identity. With tiki torches ablaze, armed weapons in hand, and hate-filled slogans ringing in the air, mindless violence took center stage as the nation witnessed hundreds clash in the streets – violence that took the innocent life of Heather Heyer. 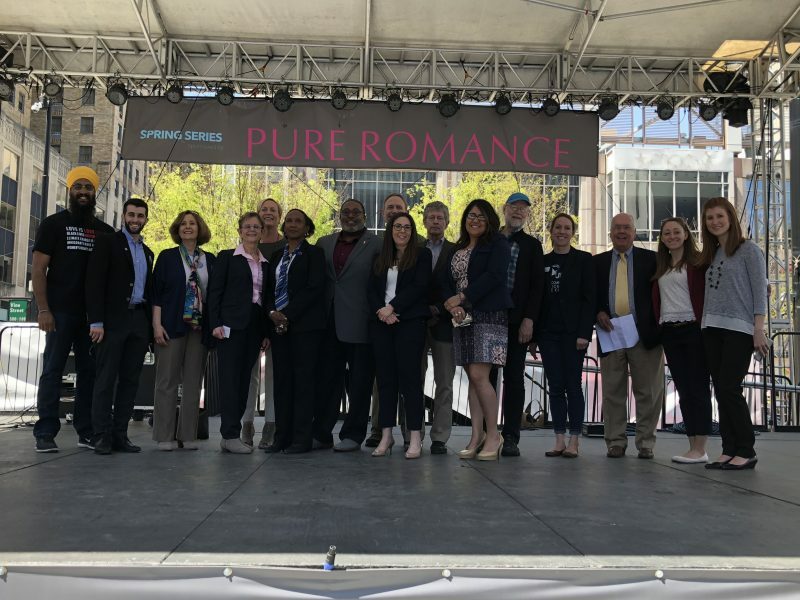 While the effects of that weekend drove many to reaffirm their own personal values, something more unique sprouted here locally: the Cincinnati Regional Coalition Against Hate (CRCAH). The first of its kind in Greater Cincinnati, this nonpartisan alliance of 19 diverse organizations has committed to being vigilant of hate activity and to speaking out with a unified voice in response to it. Through community support, education and awareness, members of the coalition aim to foster acceptance, compassion and justice to pave the way for a more inclusive region. Already, this coalition has received widespread support from community leaders, including the mayor of Cincinnati and the Hamilton County Association of Chiefs of Police. Imam Hossam Musa, of the Islamic Center of Greater Cincinnati, relived the moment when his younger sisters received death threats and harm while jogging with their hijabs. Faced with the choice between cowering in fear or practicing their faith, Imam Musa and his sisters were not deterred. Instead, they committed to a morning jogging routine and reaffirmed their place as Americans. Balpreet Kaur spoke powerfully on behalf of the Sikh community as she recalled challenges of growing up in a post-9/11 world with hate crimes and mass shootings, including a white supremacist opening fire on an entire congregation at a Sikh gurdwara in 2012. Refusing to succumb to fear, she vowed to stomp out the flames of hatred with the fires of love and compassion. Karla Bolder, a member of the Hispanic Chamber Cincinnati USA, shared an emotional story of her son being bullied and alienated for being “too Mexican” and her struggle to provide support for innocent children who are scared into silence about racist encounters in school. She urged the crowd to practice intentionality, so we look beyond politics and recognize the humanity in all. These stories – while heartbreaking and shocking – depict the realities of racism and bigotry that many throughout Greater Cincinnati face daily. They call on each of us to do our part towards the goal of eliminating hatred in our communities. They inspire us to find our own “courage under fire,” and to become upstanders instead of bystanders. “History tells us if you walk righteously and courageously, you will walk through some fire. But, if we walk together with our heads held high while guarding our hope, positive change can come,” said Chris Miller from the National Underground Railroad Freedom Center, a founding member of the coalition. CRCAH is committed to promoting inclusive values; monitoring activity that runs counter to these values; creating timely responses to hate crimes and bias incidents; assisting victims; and conducting year-round community education on the causes and prevention of bias, bigotry, and racism. We are asking for upstanders who will join us to visit cincinnaticoalition.org to learn how. We each have a role and responsibility to challenge racism and to call out hatred in all its forms. Let us teach inclusiveness, unity and harmony within our social circles, in our schools, at the workplace and through our actions. Let us go beyond tolerance and practice love for our neighbors. Let us pledge to walk together, with our heads held high, through the flames of hatred towards better days for all.